Just prior to Christmas this past year, the House of Representatives and the Senate passed tax overhaul legislation, which was sent to President Trump’s desk for signing. While the tax bill is primarily aimed at income tax and corporate tax passthrough adjustments, real estate attorneys have been hard at work analysing the bill’s tax deductions for homeowners. Among the highlights of the tax bill include standard deduction increases set to sunset in several years as well as deep cuts in the corporate tax rate from 35% to 21%. From all reports, the tax bill encompasses the Republican vision of a trickle-down economy. However, what has not garnered as much attention is the effect of the tax bill on the real estate and housing market at large. Of the provisions in the tax code that will have the largest immediate effect on the real estate market is the property tax deduction cap. Prior to the tax plan’s passage, homeowners who itemized their taxes were allowed to deduct their state and local income and property taxes from their federal income tax returns. As a result of the tax plan, the State and Local Tax (“SALT”) deductions are now capped at $10,000. As a result, more taxpayers who used to itemize their taxes will now have reduced incentives to itemize (particularly due to the doubled standard deduction, which is discussed later). The result of the SALT deduction caps is that where you live will affect your outlook on the real estate market. 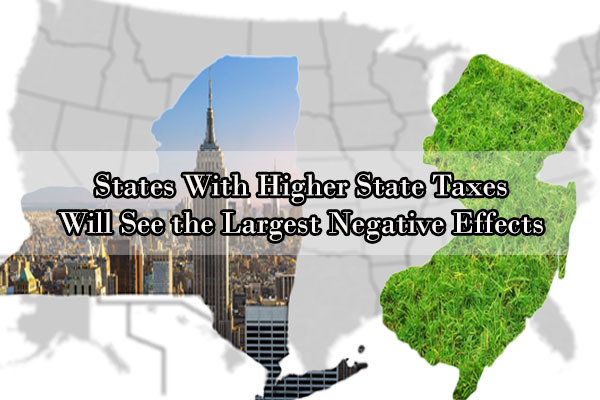 Higher tax states will see higher taxes because fewer taxpayers can itemize their taxes. This is particularly true for middle to upper class individuals. It is important to note however, that the SALT deduction caps only affect the housing market. The rental market will remain largely unaffected because the property tax deduction cap will not affect renters. That said, however, the SALT deduction caps may make it less likely that current renters will move into the real estate market. Unfortunately for New Yorkers, the areas highest hit by the SALT deduction caps are New York City, Newark, and Long Island. In New York City, the effective property tax rate is 1.2%. More than one fifth of all property owners will be unable to deduct all of their property tax exposure over $10,000, let alone any exposure from state and income taxes. As a result, it is highly likely that a solid percentage of New Yorkers will see a tax increase and be less likely to enter the real estate Market. Newark, New Jersey, will likely see a similar hit with its effective 2% tax rate, which results in nearly one-third of all homeowners unable to deduct all of their property tax exposure. The hardest hit economic region in the country, however, will be Long Island. Long Island sees similar property tax rates to New York City, but property values tend to be on average higher overall. As a result, a little less than half of Long Island residents will see their property tax exposure fall underneath the SALT deduction cap limits. The Trump tax plan will affect the ability of homeowners to deduct mortgage interest from their federal income taxes. 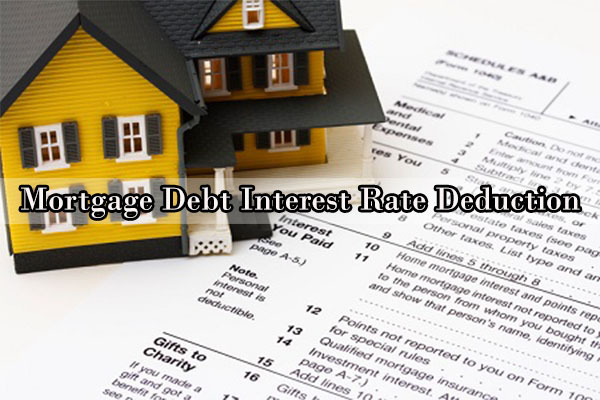 The tax plan affects mortgage interest by lowering the cap on mortgage interest deductions for certain categories of interest on mortgage debt. The mortgage interest deduction caps were reduced from $1 million to $750,000. Prior to the tax bill’s implementation, homeowners could deduct any interest paid on a mortgage that amounted to at least $1 million. That cap has now been reduced to affect only interest payments on the first $750,000 of a mortgage. These mortgage interest rate changes, naturally will only affect the wealthiest portion of Americans, as few people own either homes with mortgages of over $750,000 or second homes/vacation homes. These mortgage interest rate changes, naturally will only affect the wealthiest portion of Americans, as few people own either homes with mortgages of over $750,000 or second homes/vacation homes. However, brokers should be aware of these changes in the tax plan because it will affect how brokers choose to market higher value homes. Additionally, the tax plan might cause particularly wealthy homeowners to reconsider purchasing a second home unless they choose to rent the property out during part of the year. Also keep in mind that home flippers may still be able to deduct excess mortgage interest as a business expense. Like the changes in mortgage interest rate deductions, the tax plan affects interest paid on home equity loans. As of 2018, any interest paid on home equity loans can no longer be deducted from federal income taxes. This change will affect the finances of anyone who currently has home equity loans, as their tax exposure will increase; however, the change will create a greater shift in the real estate market. Specifically, brokers will need to reorient clients on smart home financing, as home equity loans are now less attractive than before the tax plan. There has been a lot of confusion about the capital gains tax rates for homeowners, as different versions of the tax plan affected this exclusion in various ways. However, the final version of the tax plan keeps the capital gains exclusion rules largely the same. Home sellers may exclude up to $250,000 (joint filers may exclude up to $500,000) when selling their primary residence if they have lived there for at least the last two out of five years. The only change will be at what rate the capital gains are taxed due to the alteration of the tax brackets. The major news coming out of the Trump Tax Plan are the changes to the existing tax bracket structure, the corporate tax rate deduction, and the doubling of the standard deduction. These various changes do not directly impact the real estate market (although the corporate tax rate deduction may affect the corporate profits of real estate firms), but they do affect the aggregate economy by increasing the amount of money that the average consumer has to spend. The problem is pinpointing what the actual market effect will be. First, changes in the tax brackets will either increase or decrease the overall tax exposure of certain individuals depending on where they fall within the tax bracket. The poorest Americans will likely see no difference due to tax bracket changes because the lowest brackets almost always had their tax burden mostly eliminated by taking the standard deduction. The richest Americans will likely see a windfall due to tax bracket changes that reduce their tax burden from almost 40% to closer to 35%. According to the trickle down economics theory, decreasing the tax burden on the wealthy will stimulate the market as a whole. Whether this is true of the real estate market is uncertain. People paying into the highest tax brackets likely already own large homes, but the reduced tax burden could spur more to buy second homes or vacation homes. The effect of the tax bill on the middle class is hard to speculate on. Many middle class tax brackets remain largely the same, which means that other portions of the tax bill (such as the SALT deduction caps) may affect their income more than the bracket changes. Second, the corporate tax rate deduction may result in a windfall for business owners and shareholders, possibly increasing aggregate economic activity. A reduction of the corporate tax burden from 35% to 21% is a major reduction in tax exposure for most businesses. Businesses could utilize this tax windfall in one of two ways: (1) pay out dividends to shareholders; or (2) reinvest in the business. If the result of the tax plan is to increase corporate dividends, the largest benefit to the real estate market will come from business owners and equity holders. If on the other hand, corporations choose to reinvest in their businesses either by increasing wages (see for example, Walmart) or by hiring additional staff, could cause more members of the working and middle classes to enter the real estate market and leave the rental market, although any actual impact of the tax plan’s corporate tax rate decrease is highly speculative at this time. Finally, the doubling of the standard deduction will likely result in additional tax savings for many Americans. It is hard to determine whether these savings will be enough to push new consumers into the home buying market, but the overall macroeconomic effects of the standard deduction doubling are likely positive. Because the tax plan has recently been passed and is still in the process of being implemented, it is very difficult to forecast the actual effects of the tax bill on aggregate economic activity. In particular, it is hard to say whether the tax plan’s major provisions will have any effect at all on the real estate market, as real property is often an expensive investment for most individuals. Given the recent recovery of the real estate market; however, it is probably safe to say the the effect on the real estate market will likely be positive, if there is any effect at all. The reality is that the real estate market is largely perception-based and heavily influenced by consumer confidence. If people seeking to buy homes believe that they are able to meet the financial burden of homeownership, they are more likely to do so. A tax increase in some areas could depress the local real estate market, whereas a tax decrease in other areas could result in more sales. 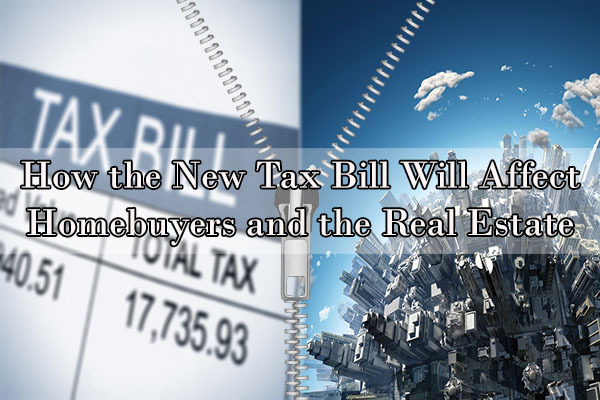 Real estate brokers should be conscious of these tax changes and be prepared to educate new homeowners on their possible tax exposure after purchasing a new home. Brokers seeking to take advantage of the tax savings of some consumers should plan to take advantage of the tax bill and market their services accordingly. On the other hand, brokers operating in areas such as Long Island that may see tax increases as a result of the tax bill should instead focus their efforts on mitigating the effects of the tax bill. This includes reading up on current tax literature to be better able to answer client questions. Additionally, brokers should consider preparing printed materials about the tax bill for clients to use when planning their home purchases. Despite the foregoing, a shadow looms over the long-term effect of the tax plan. Real estate market prognosticators should keep in mind that the individual benefits contained within the tax plan such as the doubling of the standard deduction expire on December 31, 2025. This makes long term planning difficult because one of two events will occur that will alter the course of the market from 2026 going forward. A rollback of the individual tax provisions such as the standard deduction increase is the functional equivalent of a tax increase. Tax increases tend to reduce consumer spending in the short term as consumers adjust their finances to account for higher tax rates. As most brokers know, the real estate market is more firmly rooted in perception than in actual economic reality. Consumer confidence plays a massive role in a prospective homebuyer’s decision to purchase a home. In other words, when a consumer feels they have more money in their pocket, they are more likely to make large purchases; however, if consumers feel the belt being pinched, they will spend conservatively. As a result, in the long term after 2026 if the tax benefits expire, the real estate market will likely become depressed with fewer home sales occurring across the board. On the other hand, it is also likely that Congress will move to make the Trump tax cuts permanent in 2025 or at least extend them several years. Very few politicians want to be placed in the position of defending tax increases. In general, Republicans seek tax cuts and will probably not oppose at least a short term extension of the individual tax benefits. As for the Democrats, the portions of the Trump tax plan they were in favor of are the provisions that are expected to sunset in 2026. 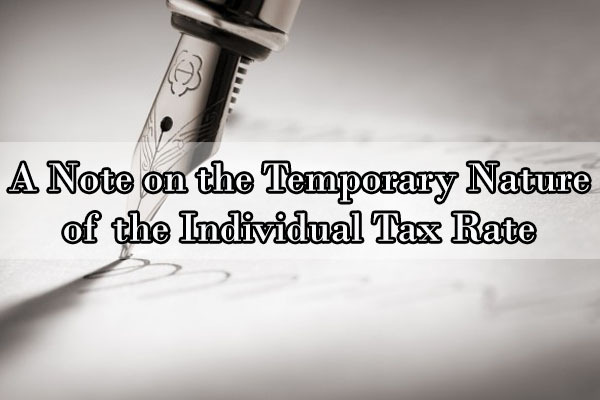 As a result, it seems likely that the tax benefits will be made permanent in the near future, given the bipartisan appetite for extending the benefits. While the ultimate effects of the tax bill on the economy are uncertain, it is not too early to begin projecting market forecasts for the immediate future. Real estate brokers should be mindful of the tax bill’s homeowner tax deductions when showing new homes, as the tax bill will affect family finances at least slightly in the short to long term. 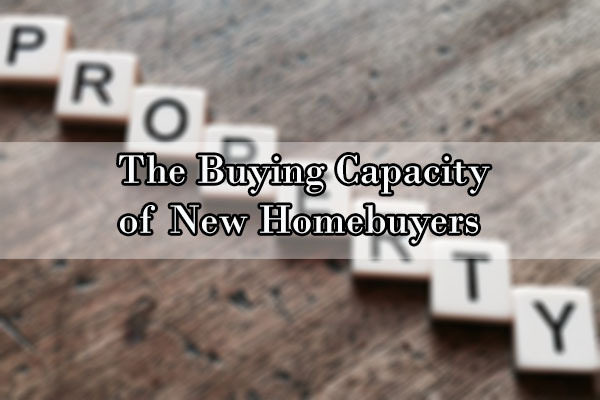 As a result, certain prospective homebuyers may be more interested in buying whereas homeowners may take the opportunity to upsize. That said, the largest benefit of the tax bill is likely going to be an increase in consumer confidence rather than an actual increase in financial buying power. As a result, brokers should focus on increasing sales as a whole rather than looking to make higher value sales in the short term. 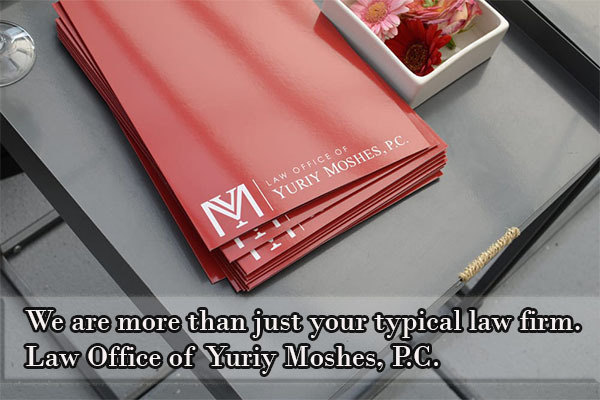 The Law Offices of Yuriy Moshes is a full service real estate law firm in Brooklyn representing both homebuyers and homeowners as well as real estate brokers in the home sales transaction process. As real estate attorneys, we are eagerly following the implementation of the Trump tax plan and evaluating its effects on the real estate market. If you have any questions about the tax plan’s effect on the real estate market or homeowner tax rates, please contact our law firm for additional information. NOTHING IN THIS ARTICLE SHOULD BE CONSTRUED AS LEGAL, REAL ESTATE, OR TAX LAW ADVICE. ALL TAX QUESTIONS SHOULD BE REFERRED TO A QUALIFIED TAX PROFESSIONAL. EACH CASE IS UNIQUE, AND A TAX PROFESSIONAL CAN BETTER EXPLAIN HOW THE TAX BILL AFFECT YOU SPECIFICALLY.